Blood 2 is a fun sequel to Blood, a cult classic FPS from Monolith. Instead of the Build engine used in Blood, Blood 2 designers opted this time to use the enhanced version of Monolith's in-house LithTech engine. Your protagonist, Caleb, is back to fight the CABAL, an evil cult that worships the Dark God Tchernobog. BLood 2 is essentially bigger and better Blood. There are more weapons, enemies, and levels than in the previous game. The level design, one of the highlights of Blood, is even better in this game: in the first episode alone, you will travel from a museum to a huge science facility, to dark city alleys, and finally to a futuristic flying machine. Caleb's funny and witty one-liners are back, and the soundtrack is even better than in the original game. As in the first game, Blood 2 offers a lot secret passages and other pleasant surprises. You can also choose not to control Caleb but some other protagonist who is among "the Chosen." Each of the Chosen has a different weapon specialty and comes with their own set of taunts. But you will see the mini-movies and hints during the game only if you play as Caleb. The graphics are also much better and clearer drawn than Blood. Instead of blurry, dull palette, you see vivid environments brought to life in SVGA, with plenty of detail. When all is said and done, though, the game itself doesn't feel as fun as Blood. Perhaps it is because a lot of so-campy-it's-funny elements have been replaced with a more ominous plot and more threatening monsters. But Blood 2 still remains very entertaining and highly replayable, especially with fun multiplayer levels and a full map/level editor. 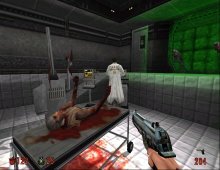 Best of all, Monolith has released the source code and other nifty tools for the game into the public domain, so if you want to try making your own FPS, check out the official site.